Definitely never too late to read something. An excellent book that always merits a revisit. I remember in college, there were many debates about the “virtue of pride”. It may be helpful to note that the pride described is not hubris but “megalopsyche”, so that it could be better rendered “magnanimity” or “greatness of soul”. Although he gives some characteristics that are less essential (but still make great aphorisms “the magnanimous man is never in a hurry”; “the magnanimous always speaks in a deep voice”), the most essential characteristic is having a right estimation of one’s own capacity for greatness; in this way one will neither squander their ability on the one hand or aim for things above them on the other. I’m glad you enjoyed it! Oh–I remembered one more thing. You mentioned how Aristotle does not include “love” among his moral virtues, but…he spends two whole books on friendship! I too always thought it was strange that he seemed to neglect love, but I really think now that the section on friendship fills that gap. Thomas Aquinas defines the theological virtue of love/charity as “friendship with God”, so it is reasonable to see the friendship of books 8/9 as the human equivalent of this virtue. I apologize for responding so late to your wonderful comment. 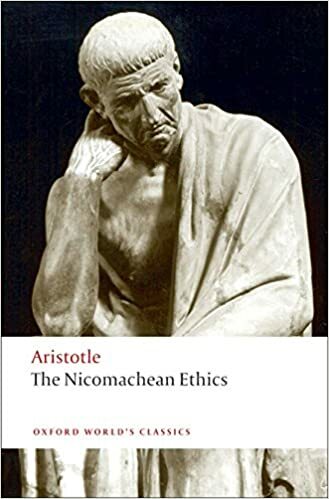 I am currently working on a project that looks at the reception of Aristotle’s Nicomachean Ethics in Montaigne’s Essays. Thank you for the correction about pride. I falsely assume that pride always referred to hubris in the classical world. Pride as Aristotle describes it (magnanimity) would be a good thing. I recall reading an article in which Montaigne’s magnanimity is discussed. I have recently become interested in reading Aquinas (thanks to Deny’s Turner’s biography) . I am aware that he included charity as a theological virtue, but I haven’t read the sections of the Summa on ethics. I’m definitely Team Aristotle.